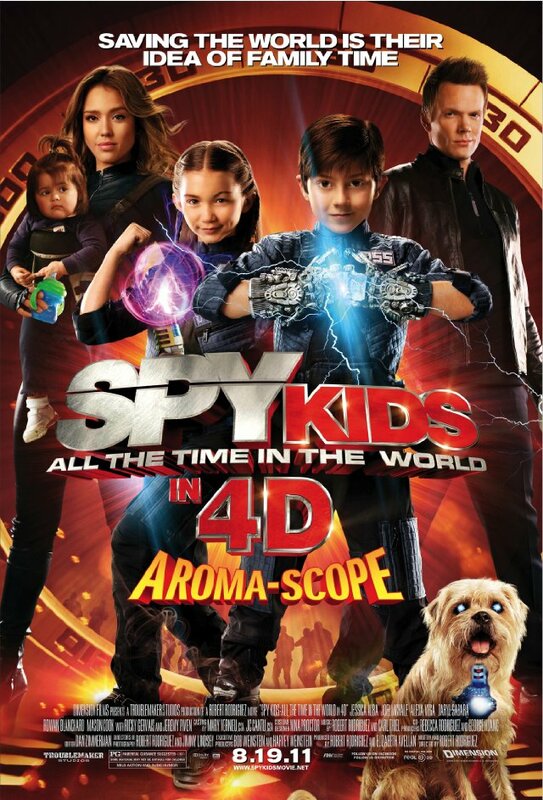 Spy Kids: All The Time In The World in 4D but you wish you could get the time back that you spent to watch this dreck. Maybe I totally missed the boat on this one by not seeing it in theaters and taken part on the scratch-and-sniff sticks that matched key points in the film, and also the 3D stereoscopic aspect. Maybe I could have had my mind blown by smelling baby poo and having bad CG clock gears jammed in my face? Most likely no, I did not miss that boat. One, I didn’t even know this was in the theater, much less being made. Two, I don’t like smelling things that make me want to vomit – like vomit. And three, if I wanted to feel like I was immersed in a clock, I would rather do it with Martin Scorsese and Hugo, which is a film so far beyond this film that its an affront to mention them in the same review. Yes, I’m affronting. What the Hell happened to Robert Rodriguez? Or rather, what is happening to him? Have his meds run out? Can one man really write and direct Planet Terror and Machete, and then turn around and direct these Spy Kids movies and Shark Boy and Lava Girl? Or are these two different people like Christian Bale in The Prestige? Regardless or who directed this mess, it fails on absolutely every level. And when your demographic is males ages 7-10, they really are forgiving. But evidently he has some market cornered because the modest $27M film banked $68M worldwide, which just makes me sad on all levels, and ensures that Rodriquez will make another. FURTHERMORE, it was nominated for an ALMA award for “Favorite Movie”!!?? What are the ALMA awards you ask? I had to look this up because they are so high profile. It’s the American Latin Media Awards: A ceremony made more legitimate by nominating Cameron Diaz for her role in Bad Teacher. Her hideous performance as a hideous person in a pretty hideous movie is beside the point though. How many people out their immediately think “Latin” or “Hispanic” when Cameron hits the screen? Because her name is Diaz? – OK, going off track here. So the OTHER nominees for Favorite Movie were A Better Life, Rio (? ), From Prada to Nada, and Machete(?). A Better Life was the winner and it should be – why? Because it’s a good movie. Rio? Really? Starring those Latinos Jesse Eisenberg and Anne Hathaway? Or maybe Tracy Morgan. No, it has to be Kiwi Jemaine Clement.. Jamie Foxx? Will.i.am? The only Latin voice in a character with more than one line is George Lopez, and he’s only in it because his contract states that he must be a voice in every animated film, or else he threatens the population with another talk show. From Prada to Nada is an offense to Mexican Americans. And Machete is an offense to humanity – regardless of entertainment value of the Grindhouse style violence and a bare-breasted appearance by Lindsey Lohan (Latina? ), who looks like the filmmakers picked her up after a binge and threw her onset to film her. Basically, Spy Kids 4 was nominated, because only 5 Latin films (one very questionably Latin despite its locale) were made. Some reasonable talent signed up for this thing and I don’t know how or why. Maybe they had an afternoon free and Rodriguez was paying for the tequila. Jeremy Piven? Ricky Gervais? Wasn’t Gervais’ series Extras specifically about someone talented who sells out? Alexa Vega (From Prada to Nada) returns reprising her role of Carmen Cortez, one of the original Spy Kids. And Daryl Sabara returns as her younger brother Juni who was hardly a cute kid when he was a kid, and it looks like he went the Macualay Culkin route and grew up to be a not-handsome man. But I’m afraid Antonio Banderas did not show up to exude his Spanish charm and save the film… speaking of which, where was Puss In Boots in this ALMA lineup? RIO?!? Puss In Boots booted Rio out of an Oscar nomination. And it gets slighted at the ALMAs? The story is severely flawed as is the whole rationalization of traveling back in time, or why and how time is even speeding up. They can’t even get the science right as to why you theoretically cannot go back. Its filled with horrid cartoony sound effects. Vomit bags. Baby poo. Dog farts. Flying food. Slimey sludge poured over people’s heads. Its like I was reliving my childhood watching You Can’t Do That On Television. The cinematography is about as dynamic at a sitcom. The FX are one step above Sharktopus. And the character of Argonaut the talking robot spy dog (Gervais) talks with the subtle nuance of Charlie McCarthy. The message of the film which is about how you need to enjoy the moments you have with those you love is an admirable message without a doubt, but the delivery is a Mack Truck in a headon with a Miata, which would be my brain. I really can’t say anything good about this film except for that maybe, just maybe, its better than Horrid Henry. But not by much.